So, you've got a great sounding vintage Zildjian K ride cymbal but you have no idea when it was made: how do you date your vintage Zildjian cymbal? The short answer, check the cymbal stamp! Posted on July 7, 2017 by Pete and filed under Music Gear and tagged Avedis Zildjian Vintage Cymbals. 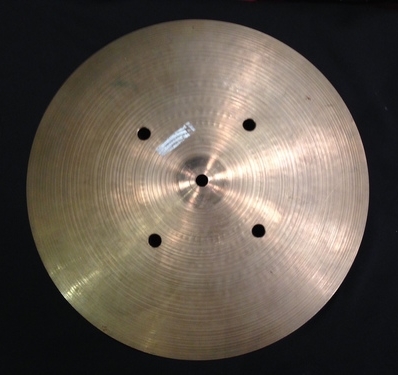 Redefining how used cymbals are sold using only sound!! Choosing cymbals is hard and I want to make it easier! That's why I've been working on recording audio and video of my cymbals so you can now hear the awesome sound of the cymbal you're buying!! Posted on February 28, 2017 by Pete and filed under Music Gear and tagged Cymbals. When you buy cymbals as much as I do every once in a while you're bound to run into a cymbal you've never seen before. This can be both good and bad, as every drummer who's bought a patina covered vintage cymbal at a garage sale knows. Sometimes these cymbals turn out to be valuable Zildjian K Constantinoples with the stamps worn off, sometimes they're cheap cymbals that sound great after age mellowed out their sound, or sometimes they're just cheap and overpriced because they look old. Recently I ran into a Zilco cymbal for cheap and grabbed it—here's what I learned when I took it home. Posted on December 15, 2015 by Pete and filed under Music Gear and tagged Zildjian History Zilco. I recently came across an awesome vintage drum kit, the 1989 Yamaha Recording Custom (model PRC1492). The owner was looking to get a smaller set of drums and swap out some cymbals and I had no problem taking on his monster Yamaha Recording Custom drums. These are Yamaha drums from the era of heavy music with over sized power toms and massive 22˝ bass drums. Posted on May 4, 2015 by Pete and filed under Music Gear, Inventory and tagged Yamaha Vintage Drum Kits. About 7 months ago, I sold this 5-pc Tama SwingStar drum set to the family of an 8 year old girl for $370. The girl was brand new to drumming, her parents wanted to get her a solid used drum kit with hardware and cymbals but didn't want to spend a lot of money in case she quit. Tama SwingStars aren't the nicest drums around but sound surprisingly good with new heads when tuned right. The deep toms, 20˝ kick drum and a set of used starter Zildjian cymbals on solid Tama hardware are a kid's dream, even if the parents would rather have a quieter, smaller bass drum. In fact used drum sets like this are perfect for starting drummers—I go through tons of used Tama SwingStars with whatever cymbals I have around. The difference is when you buy from me you know they're not ruined drum shells with bad bearing edges and keyholed cymbals. Trust me, I've seen a few drums and cymbals in my day. This 8 year old loved her drum set for 7 months until, guess what...she quit and wanted to play guitar instead. So I took the used drum kit back on trade towards a starter guitar package I had for $260 and paid the family an additional $50 in cash. So for only $60, this little girl got to play a legit Tama drum set for 7 months. Good news for the parents: now they can have their daughter practice guitar with headphones after listening to her bang on her drums and cymbals. And they didn't pay $900 for a new SwingStar at some other drum shop in Denver. That's how things roll here at Lodo Drum Guy. My drum store started when I bought a similar starter used drum set and cymbals for my own daughter (although it wasn't a Tama SwingStar). This has had a life-changing impact on my kid and no other used drum shop or music store can offer you this flexibility for $60! I LOVE IT!! you will too...see you soon. Posted on March 7, 2015 by Pete and filed under Music Gear, Inventory and tagged Tama Drum Kits. Michael Jochum Former Drummer of KORN is AWESOME!! It's not everyday that celebrities walk through my downtown Denver drum shop and loft but when Michael Jochum (drummer and percussionist formerly with Korn and Jonathan Davis and the S.F.A. ), came by my loft to check out my used drum gear, I was pretty stoked!! Posted on January 3, 2015 by Pete and filed under Music Gear and tagged Michael Jochum Korn Drum Lessons. Free Drum Lessons & Discounted Drum Gear for Students! Lodo Drum Guy is stoked to announce a new partnership with drum instructor Lane Parsons! Lane is an old friend and among the best rock drum instructors in Denver or anywhere (if you need proof just check out his drumming). Here's the deal — not only do you get a free lesson from Lane, you get awesome discounts on my entire inventory of used drum kits and used cymbals so you can get the best gear and best lessons all in one place! Posted on July 21, 2014 by Pete and filed under Offer, Music Gear and tagged Drum Lessons. One of the many perks of my job is how often I run into unique musicians and people while buying new gear. On a run to grab a four piece drum set last month I arrived on the scene and noticed some unusual instruments hanging out in a room at the seller's house. The instruments were a marimba and a cajón, and both looked like they were made from hardware materials without any of the gimmicky finishes and flourishes found on commercial versions you see in music stores. Posted on April 3, 2014 by Pete and filed under Music Gear and tagged Percussion.